Time Square New Years Eve! 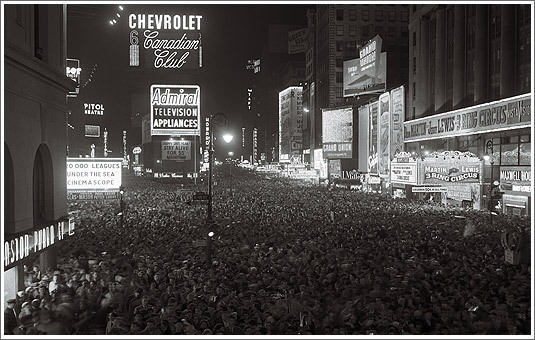 Well first off, let’s say goodbye to 2010 and welcome in 2011 – I’m sure Time Square will be as crowded as it was in the 1950’s – different but the same! 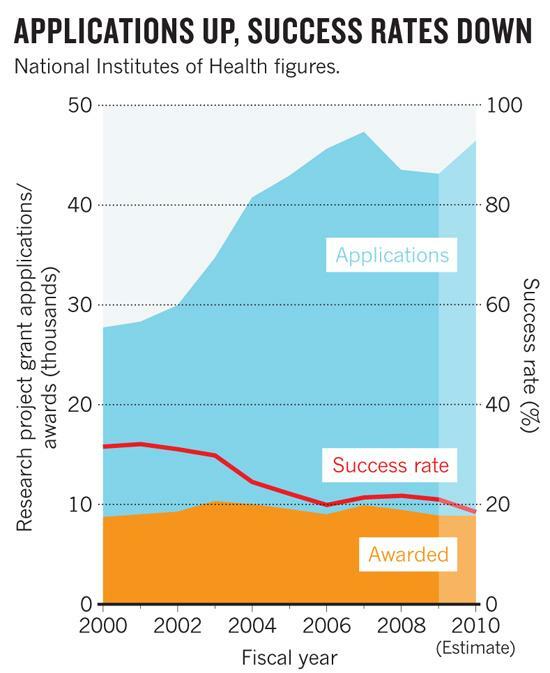 At the National Institutes of Health (NIH) in Bethesda, Maryland, which funds the majority of biomedical research in the United States, several years of flat federal funding combined with a rise in the number of applications means that 21% of research-project grant applications were funded in 2009, down from 32% ten years earlier (see graph). The situation in many other countries is just as tough. It seems then that we are setting yourselves up to fail in the future. If the decline in funding continues we will start to loose critical research because it is too edgy, too visionary, too forward thinking – just the kind of work that falls into the 20-30% band. Good progressive work is needed but those that fall into the <15% acceptance band are often safe projects with some little novelty or that propose ideas which do not trouble or challenge the reviewer. Disclaimer: Now all this could be ‘sour-grapes‘ as most of my work seems to hit at 22-25%! ← Defining UX – and a Merry Christmas 2010!